We welcome one new board member this week. 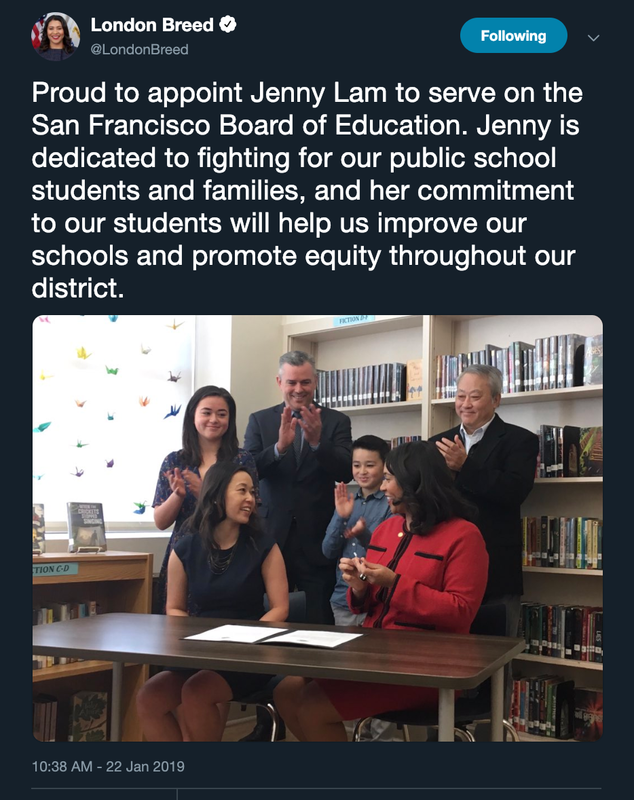 Jenny Lam was appointed by Mayor Breed on January 22, 2019 to fill the seat left open when Commissioner Matt Haney was sworn in as a city supervisor. Commissioner Lam also serves as Mayor Breed’s Education Advisor. Vote on proposed SFUSD instructional calendars for 2019-2020 and 2020-2021. Both feature school start dates in the third week of August and last day of school in the first week of June. This vote was scheduled to happen on January 15, but was postponed. The calendar was updated but there are no apparent substantive changes. Update on the Middle Grades Redesign. PPS-SF and SFUSD hosted a meeting on this topic last April. Here is a summary of the content of that meeting and feedback we heard from families. We look forward to working with SFUSD to support continued family partnership in this initiative. Update on Web Property Redesign. SFUSD has been redesigning its website over the past year. This report will likely give details of the process and timeline for rollout.